SpaceTom in testing phase! | Imagin&Tonic - VR, AR and game development. We’re close to release SpaceTom, our first game that will see the light under Imagin&Tonic brand. A lot of excitement around, big plans for the future, lot of feedback from testers and, overall, an amazing experience for the whole team. But, what is the game about? 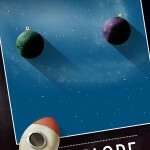 SpaceTom is a casual game which challenges the player to reach the most far away planet he can jump to. As casual game, it’s mechanics is really simple, you know what they say: “easy to learn, hard to master”, and in just a few seconds will get used to play it. But being as simple as a one-touch game, it will require all your attention, strategy thinking and game skills to reach the higher levels. Will you be able to reach the ends of the universe? SpaceTom will be free, non-intrusive ads supported, and available on iOS and Android very soon.